The SKASOL cooling water monitoring and control system accurately ensures that the optimum water quality is maintained. The system automatically compensates for varying cooling loads to provide consistently correct water quality. A SKASOL water meter with totalizer and pulse output provides a signal to the Datalogic DCT controller. The controller activates the SKASOL inhibitor chemical pump for a precise pre-selected time period. This ensures that the chemical is applied in direct proportion to make up water usage. 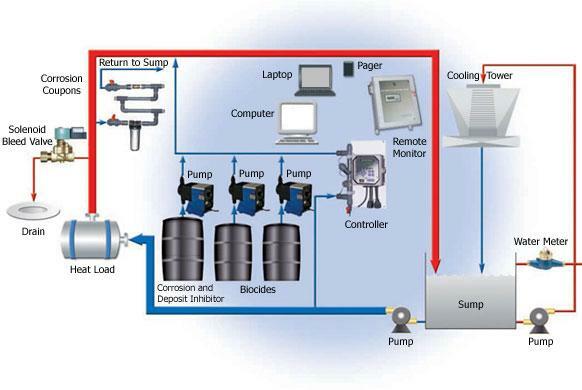 The system continuously monitors the conductivity level of the cooling water. The DCT controller activates the bleed solenoid valve as required to maintain the required cycles of concentration. The DCT conductivity setpoint is field adjustable. Biocide chemical feed pumps are activated as programmed by the DCT 28 day scheduler. The DCT also features pre-bleed and bleed lockout during biocide feed ensuring effective biocide contact at kill concentration while maintaining optimal cycles of concentration.